Specialising in all forms of telemarketing and telecommunications, Ansacom works with small, medium and large businesses and enterprises. Providing a full range of high quality call handling services to help companies ensure that they are providing their clients, customers and suppliers with an excellent experience every time they call up. 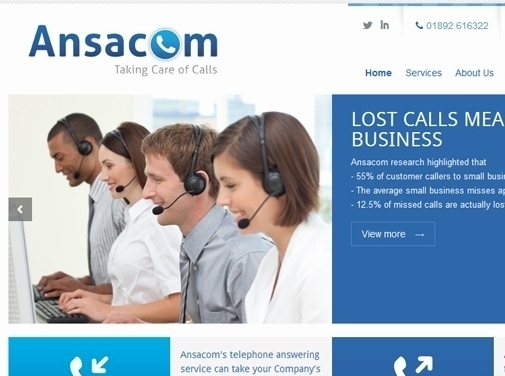 Calling on more than 15 years' experience in telephone call answering, the Ansacom team has been selected to offer personal service on every call. Whether you are a large organisation that just needs a little help during peak times or you're a small business who could benefit from having a dedicated out-sourced customer service department, Ansacom can offer everything you want. Ansacom offers an extensive list of services that could be perfect for you.These include everything from appointment booking, messaging services and order management to overflow call handling, help desk advice and more. Every solution that the company creates is bespoke to your business, ensuring you only pay for the services you need at the times that you need them – this could be anything from covering out-of-hours phone calls to helping clients following the launch of a new product. UK (Southborough) based business - established over 11 years ago - providing telemarketing and telecommunications services. Website includes details of services provided, client list, testimonials, accreditations gained, details of awards won, details of complaints procedure, news section, full contact details including company registration number.